After days of classroom training, what was supposed to have been a hands-on practice drill turned into an actual hazardous-material emergency, and Palya, Chief of the Bonham Fire Department and founder of Haz-Co Emergency Response Training Center, got to see firsthand if the lessons he had taught his latest batch of hazmat technicians had been learned. Since Palya started the Haz-Co school in 1994 at Grayson County Airport, the old Perrin Air Force Base, more than fourteen hundred students have passed through its sometimes smoky doors, learning fire fighting techniques, emergency medical procedures, and hazardous material control. Graduates can get a job at pretty much any fire department or industrial facility nationwide when they are done. Haz-Co is that good. The building had history, but little else to commend it. “The building was stripped out, no wiring, no electrical, no plumbing, nothing,” said Palya. Airport officials familiar with Palya’s plan for a training school suggested he build something new. But men with “Chief” in front of their names are used to getting their way, and Palya persisted. 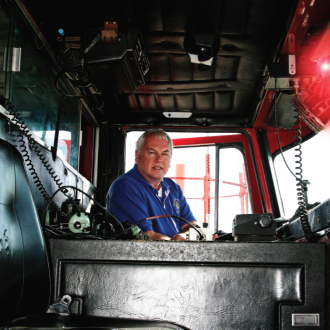 Fourteen years and $100,000 later, he has the only private fire fighting, hazardous materials academy in this part of the country, and a bit of Grayson County history still stands. Haz-Co prides itself on providing a hands-on learning experience. Classroom work is divided into thirty-two sections and when one classroom section is finished, the real world applications begin. Within the first two days of training, students are putting on firefighting gear and stumbling through smoke mazes. Whether they are learning how to put on their Self-Contained Breathing Apparatus (SCBA) or to find their way through a scorching building, discipline and taking responsibility for fellow firefighters are lessons constantly hammered home. Chief Palya makes no apologies for being hard on students. 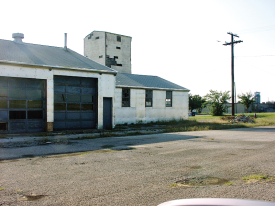 The old Perrin Field Fire Station before Haz-Co’s rehab project. He breaks the classes into three platoons, similar to three shifts at a fire department. Each platoon has a leader, who had better make sure each of his men or women (six women have gone through the academy) are ready for each class— on time, with proper materials, proper attitude, proper dress. If they are not ready, the platoon leader answers for the shortfalls. During the course, each student gets to serve as a platoon leader. Sometimes that structure does not go over well. 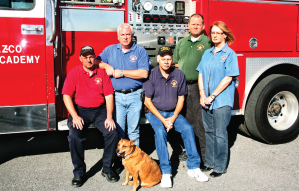 “We had one student, a chief for a volunteer department who came through the academy. He’d been a volunteer fire fighter for eight years and didn’t like the way I was conducting the training. Three days before the final exams, he let me have it. Kevin Walton was the student, and he changed his mind. He is now an instructor at Haz-Co. “Kevin has been with me eight years now. He’s one of the best instructors I have, and he’s a co-owner in the business,” said Palya. “I couldn’t stand him,” Chief Kevin Walton said of Palya. “He wanted to make an example of me and I didn’t like it.” Like it or not, Walton learned it, and now he is making examples of some of his students, for their own good of course. One of Walton’s techniques involves a sixteen-pound bowling ball. If a student is late or out of uniform or messes up an exercise, he gets a new partner, the bowling ball to lug around until instructors decide he can part with his round companion. If the student goes out to dinner, that bowling ball better be with him. When he goes to bed, the ball better be right next to him. If he goes to the movies, guess what nestles at his feet? “I’ve had students who’ve carried a bowling ball the entire class. They didn’t get the concept until they were ready to finish,” Walton said. In some jobs you can cut corners and come out a hero. In fire fighting, if you cut corners, you can come out a corpse and take down the people who were relying on you. That is why something as seemingly innocuous as learning to tie knots is made difficult for students. Firefighters are often in dark, smoke-filled buildings, so they learn to tie knots by feel, with their hands under a table. They cannot look at what they are doing. Tying the right knot, blindly without visual references, could save a life. The people who take on this challenging occupation are often coming from other careers, butcher, boxer, nurse, even minor league baseball. Twenty-seven year old Jeremy West spent four and a half seasons playing minor league baseball and wrapped his career up with the Chicago White Sox. Applicants who have graduated from Haz-Co training already have the skill sets departments are looking for. The course runs anywhere from three-and-a-half months to six months, depending on how many hours the student can put in at once and on whether they take the emergency medical training as well. When they extinguish the last flames of their training, Haz-Co grads will be certified firefighters and perhaps more. “If they make it through the course, most likely they have firefighting in their blood,” said Walton. It could be washing the trucks, dousing a brushfire, or pulling a victim from a blazing house. Whatever comes their way, Haz-Co Emergency Response Training Center firefighters know they will be equipped to handle it. To learn more about Haz-Co visit their website at www.haz-co-fire.com or call (903) 564-3862.